A small note in the Journals of Sylvia Plath indicates that the 1962 journals that form Appendix 15 were "arranged thematically by the editor as SP did not indicate a specific order" (703). They date by and large to the period after the birth of Nicholas Farrar Hughes on 17 January 1962 and continue to early July 1962, just after Percy Key's funeral. In this space of time, Plath wrote her long dramatic poem for three voices "Three Women", and a host of other "Ariel"-voice poems such as "Elm", "Little Fugue", "The Rabbit Catcher" and "Berck-Plage" as well as beautiful poems like "Pheasant" and "Among the Narcissi". When reading these journals, you can see the cross-over between the capturing of private experience in her journals and the reshaping of it in the art of her poetry, particularly in "Among the Narcissi" and "Berck-Plage" which both feature Court Green cottage neighbor Percy Key's illness, death, and funeral. The same could be truly said for the June 1962 journal entries about bees and Charlie Pollard and her transformation from prose to poetry in the October 1962 bee sequence, where jokingly one could say Plath plagiarized herself! But part of the reason for this post is "Three Women". We do not have an accurate date of composition for this lovely, long poem. The Collected Poems dates it broadly to "March 1962". Papers in the Cleverdon mss at the Lilly Library contain some information about its acceptance with the BBC for production. Her submissions list held at Smith indicates she sent it to the BBC in May 1962. In a document dated 11 May 1962, Cleverdon forwards the script to his colleagues expressing his recommendation that the Third Programme accept the piece. By 16 May, they have agreed to produce it and were coming up with fees, contracts, and the like, and Cleverdon notes that Plath's verse play was written at the BBC's "instigation" . In that the BBC commissioned Plath to write a verse play, but that the subject matter of said play was entirely up to Plath. "Three Women" aired first on 19 August 1962, and was repeated when Plath was in Ireland on 13 September 1962, as well. An obvious inspiration to "Three Women", other than Ingmar Bergman's 1958 film Brink of Life (also called So Close to Life and in the original Swedish Nära Livet), is Dylan Thomas' Under Milk Wood which Plath read in 1954 when her former managing editor at Mademoiselle sent her a tear-sheet of the poem from its first appearance in that magazine's issue of February 1954. Thomas, it is well-known, was a major influence on Plath's poems throughout the 1950s. But the writing of "Three Women" I think can be connected both to Under Milk Wood, to the work Ted Hughes was doing on radio plays with the BBC, and what Plath was doing in her North Tawton notes. Certainly it is a confluence of influence. Plath captures the time, the people, the decor, the sounds, and the atmosphere in a fashion that that makes these journals character sketches (and, we presume, notes toward another novel). But it occurs to me that with the success of "Three Women" (accepted almost immediately by the BBC) that Plath might also have been in the process of trying to out-Thomas Thomas. Even her notes captured in "The Inmate" (Appendix 10 in The Journals) serve as file of reconnaissance on people, histories, and the like, which of course Plath became interested in during her year in Boston when she was secretly copying case histories when she was employed at Massachusetts General Hospital (see "Hosptial Notes" in Appendix 14 of the Journals). So, it's a case here of working backwards, and then seeing a clear lined of development. You may be asking: When did Plath see the Bergman film? In February 1961, the Everyman Theatre in Hampstead ran a special season of Bergman films that lasted three months. This was done after a similar and successful season of his films ran in 1960. The films showed in chronological order of production, and Plath wrote in a letter home dated 26 February 1961 that she and Ted Hughes had been going to see the Bergman films. So, Bergman was on her mind. Concurrently to the Bergman season at the Everyman, the Academy Cinema, then located on Oxford Street, began airing his So Close to Life from 24 February 1961. It appears to have run for just over one month as it stopped appearing in the film listings section of the newspaper I checked after 31 March 1961. Film listing for 24 February 1961, The Times. The other interesting aspect to these journals is that because they are "arranged thematically", we have thus lost some context to their original structure. Or, have we? I have been to Smith College more times than I can count over the last sixteen years, but never have worked with the originals of these entries. They are typewritten with autograph manuscript corrections here and there, on long, lined paper. Very densely written. On a trip to Smith on Monday, I worked with them for the first time and was relatively surprised to see that these typescript "Notes on Neighbors" (as Smith calls them) are in fact already organized by person. That is, Plath has them typed up according to the neighbor/townsperson. Which I think makes the note that they were arranged "thematically" by the editor problematic. Admittedly it has more to do with me than with anything Karen wrote! What Kukil meant, I think, is that the order in which they appear in the Journals (The Tyrer's, The Midwife, Mrs. Hamilton, Mr. & Mrs. Watkins, The Webbs, Nancy Axworthy & Miscellaneous Intelligence, Charlie Pollard, Major & Mrs. Billyeald, Mr. Ellis, and Rose and Percy Key) is what was arranged by the editor as over the years Plath's own original order has been lost beyond reconstruction. Regardless, though, we can use the dated entries -- along with her valuable Lett's Tablet Diary and letters -- to help inform Plath's daily activities. Of course these journal "Notes on Neighbors" are a small, separate slice of what her actual personal diaries might have contained. David Trinidad has written provocatively on the subject of Plath's "missing" journals in his 2010 essay "Hidden in Plain Sight: On Sylvia Plath's Missing Journals". This essay is "must read" material. The concept of capturing details of people and places started in London during her time living in 3 Chalcot Square. For a significant period of time, Plath visited houses for sale and learned about the real estate market in the Primrose Hill "district" with the hope and intention of buying a place if one came up that was affordable and right for her family. In letters to her mother she captures very exacting detail about the interior design of these houses and flats in such as way as to make what she was doing in these journal notes a development of what she was writing home. It is tantalizing and taunting to read, from time to time in her letters, how she longs for quiet time and space to write in her diary about her life, pregnancies, or to capture the episodes from events attended and people that she was meeting. All links accessed 9 January and 23 April 2014. Post slightly revised on 28 April and 3 May 2014. PS: This has nothing to do with anything, however, Brink of Life, opened in Boston, Massachusetts, at the Telepix Theater on 16 June 1960, Plath's fourth wedding annivesary. The film was also showing in New York City in November and December 1959. It is only marginally conceivable, to me, that Plath and Hughes saw this before departing NYC for England on 9 December 1959. Un Chien Andalou (1929) (Vimeo, YouTube) is a sixteen minute silent surrealist short film produced in France by the Spanish director Luis Buñuel and artist Salvador Dalí. That semester in the spring of 1951, Plath was taking Art 13. The prior entry to her "Notes on an experimental film" can be dated to late March; and the subsequent entry is her poem "April 18" (untitled in the journal, but it appears under that title in her Collected Poems). Hard to know when Plath saw the film, but, her notes are interesting in light of the fact that we can now readily watch the film for ourselves through mediums like YouTube and Vimeo* and consider it through the perspective of the notes she took. Sometimes looking into trying to date Plath's undated journal entries and letters leads to frustrations and false starts. Initially, I thought that perhaps her calendar for this year, held at the Lilly Library, might reveal something. In that calendar, which I reviewed in October 2012 while at IU for the Plath Symposium, Plath has marked that on 22 March she was going to the movies with someone called Tony Stout. Plath would have been back in Wellesley at this time, as her Spring Recess that year was from 21 March to 5 April. However, after searching the Boston and Wellesley newspapers, it was determined that Un Chien Andalou was not listed as a film playing at any of the local cinemas that day. The closest possibility was a South Station cinema which was playing "Shorts." But, there was no identification of what was included in these, though mentioned were cartoons and news stories. So, it seems unlikely. Plath spent some time during the Spring Recess in New Jersey and New York. Is it possible she saw it there? Or, is it possible that film was something she had seen in a class either before or after Spring Recess? I wonder if this film was perhaps a requirement listed on the course syllabus? But it might also be that her interest in film and the visual arts lead her to see the films as an extracurricular activity. In a letter held by the Lilly Library, which was not part of Letters Home, Plath writes that she saw a "shock film" by Dalí and that seeing it was an act of free will. The letter is dated "Tuesday night" and was postmarked 11 April. 11 April that year was a Wednesday, making the date her letter was written 10 April 1951. The Smith College Archivist, Nanci Young, provided some information about her Art 13 course. Art 13 "Basic Design" was taught by Mervin Jules (info; obituary). The course description was: "The visual properties of color, light, volume, space, shape, line, texture through study of simple problems dealing with the nature of these elements, the use of materials and their creative application. For Freshmen, Sophomores, and Junior transfer students. M 9; eight studio hours of which four must be T W 2-4, Th F 10-12 noon, 2-4." Karen Kukil checked the Smith College Bulletin, looking at the calendar for the Week Beginning 8 April 1951. And sure enough, shown on Monday, 9 April 1951 were "Three experimental films presented by Studio Club." The three experimental films were: "Ballet Mécanique, Cinema Anémique, Le Chien Andalou (scenario by Salvador Dali)." They were shown in on campus at Graham Hall at 7:15 P.M.
Ballet Mécanique is a 1924 art film by Fernand Légerdates in 1924. Cinema Anémique (actually Anémique Cinema) is a 1926 film by Marcel Duchamp. So, though the pieces are scattered between different archives in different states it is possible with a little work and querying to fill in some gaps. Anyway, part of the the point of this blog post is that we now know that Plath's journal entry 64 was made on 9 April 1951. *All links accessed 1 March 2012, 7 May 2013, 6 June 2013, and 9 April 2014. I have been working on this post off and on for quite some time --since March 2012-- and in that time, several online versions of the film have gone up and been removed … So please keep that in mind if you are greeted with bad links in this post. P.S. : If you are interested in Un Chien Andalou, you may also be interested in another Buñuel/Dalí film, L'Age d'Or (1930) (YouTube) ,which Plath saw while on Fulbright to Cambridge on Wednesday 1 February 1956 through her membership with the Cambridge Film Society. This is the third post on Plath's passport. Read the first one here and the second posting here. Sylvia Plath received a new passport issued by the Department of State Passport Agency in Boston in 1959. The date of issue was 8 September 1959. This passport is held by Emory University in the subseries of Plath papers in the larger Hughes papers (collection number 644). Plath's occupation on the document is "Writer". There are far fewer stamps in this passport than in her first one, which I posted about on 22 March 2014. That's it! No stamps for either her July 1962 trip to Wales or her September 1962 trip to Ireland. Domestic responsibilities including the care of her baby/babies precluded other trips, such as their intention to spend three months abroad on the Maugham Award that Ted Hughes won. In fact, the 17-day trip to France was largely made possible as Plath's mother was in England at the time, taking care of their 15-month-old daughter Frieda. Plath renewed her passport on 11 October 1961 at the Consulate of the United States in Southampton, England. This was done just over a month after she and Hughes moved from London to North Tawton; in-between writing "Finisterre" and "The Surgeon at 2 a.m." on 29 September and "Last Words" on 21 October. The renewal was good for four years. The journey from North Tawton to Southampton, by car, according to Google Maps is roughly 3 hours and back in 1961, it might have taken a good while longer. No matter though it would have been a full days' effort to get there and back. Plath wrote letters to her month on 6 October and 13 October, but made no mention of this excursion in either. It is possible that she mailed her passport, too, rather than driving to have it renewed. The last dated stamp in the passport is 1 March 1963 when Sylvia Plath's passport was canceled/annulled at the American Embassy in London following her death. Someone at the consulate wrote "HOLDER DIED IN LONDON ENGLAND FEB. 11. 1963." All links accessed 16 February 2013 (! ), 18 March and 2 April 2014. 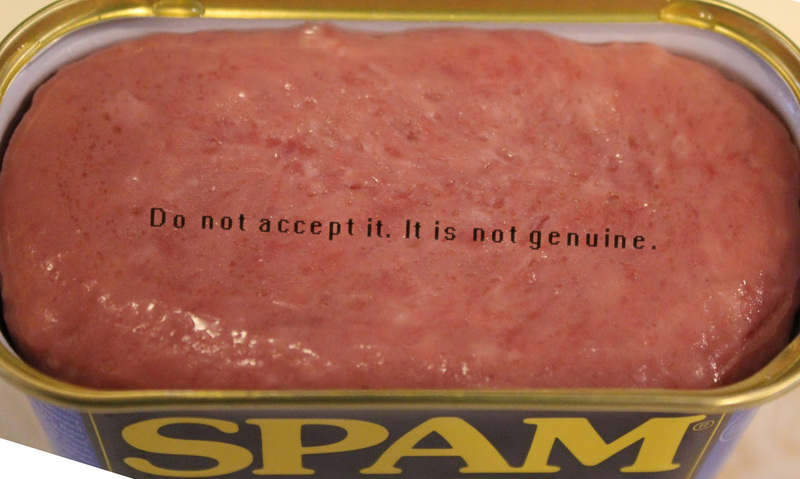 The Estate of Sylvia Plath, HarperCollins, and Hormel Foods, the makers of SPAM, have joined together for National Poetry Month and released a special, limited edition SPAM with lines from Plath's poetry branded on the product. A special chemical added to the product will commit that poem to the memory of the consumer in five languages: English, French, German, American, and XML. 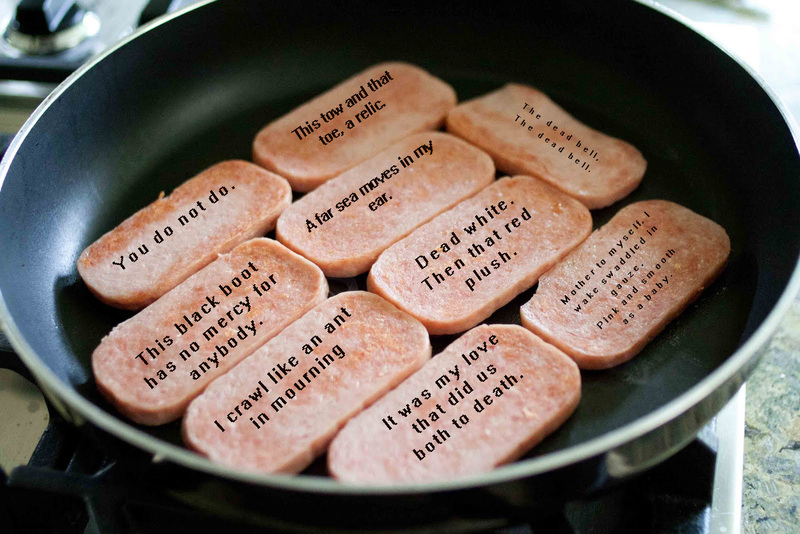 The precooked meat has also been re-packaged with SPAM serving as an acronym for Sylvia Plath American Muse. These can be found in grocery and convenience stores across the United States. 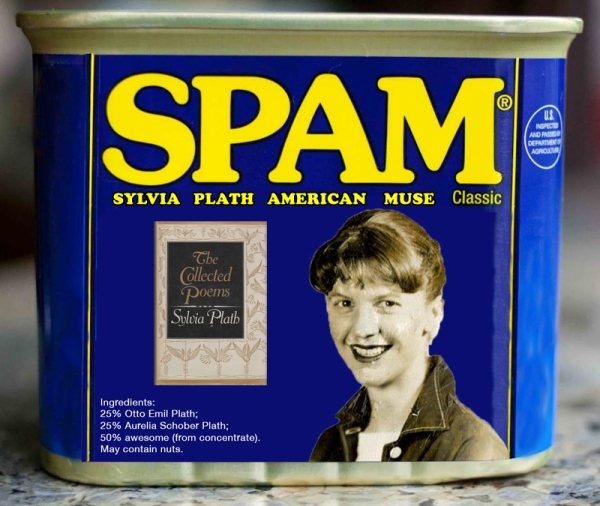 While this may seem random, but Plath was familiar with SPAM. Plath wrote a letter to her mother on 15 August 1952 about a lunch that her then kind-of-still boyfriend Richard Norton made for her down in Cape Cod. She writes that he was adorable and was very insistent that he made a lunch salad which consisted of cantaloupe, melon, cheese and spam. She described it as artistic. The letter is unpublished. The other reason, is to commemorate a significant anniversary: It is exactly the 32 years, 4 months, and 5 days anniversary of the publication of Plath's Collected Poems, which was first published in the US in November 1981 by Harper & Row. Beginning today, also, bookstores around the country will be selling, special limited edition Collected Poems printed on compressed, treated, and thinly sliced SPAM. The type is a mixture of pepper and black sesame seeds. Comparable to "onion-skin", SPAM-skin is cheap and lightweight; it is also biodegradable and eco-friendly paper. The book weighs approximately .5 ounces, will ship anywhere in the world reasonably, and can be eaten should you be too hungry.